After you see this list, you will surely not just dump firewood anywhere! 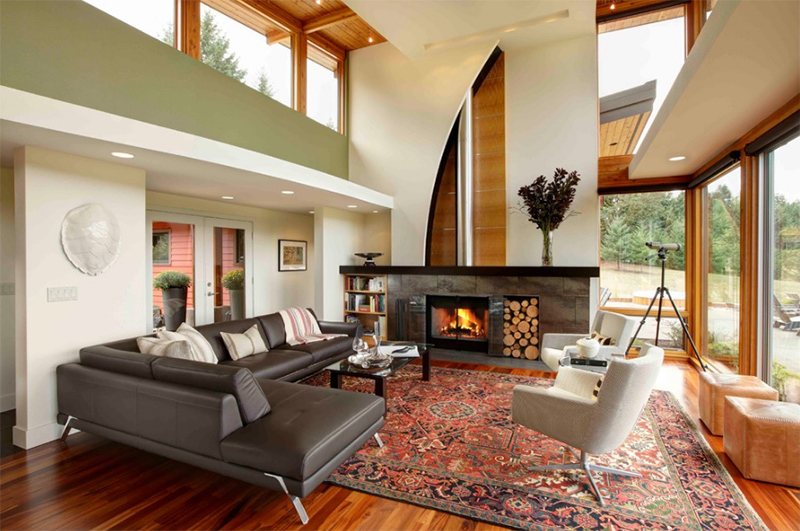 Although not all homes have fireplaces because of the varying weather and seasons, there are still many homes around the globe that actually have one. 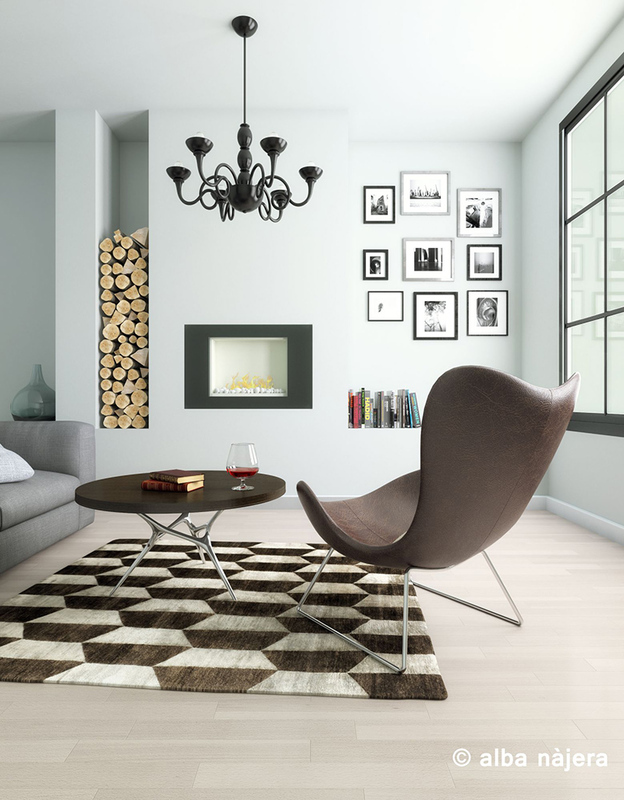 The fireplace is one of the focal points in every space from a living room to a bedroom. And these would come in different designs and styles. They would also have varying finishes as well from stones ones to those with copper ones. And apart from that, even the manner of storing firewood could also vary and could also add decor to the home as well. 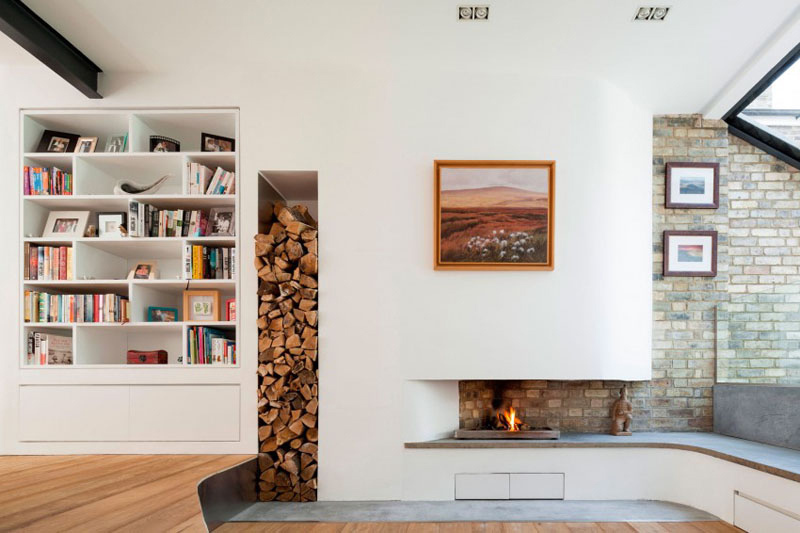 With that, I will share to you a list of living areas that showcase good examples of storing firewood because it could also add appeal to your home. 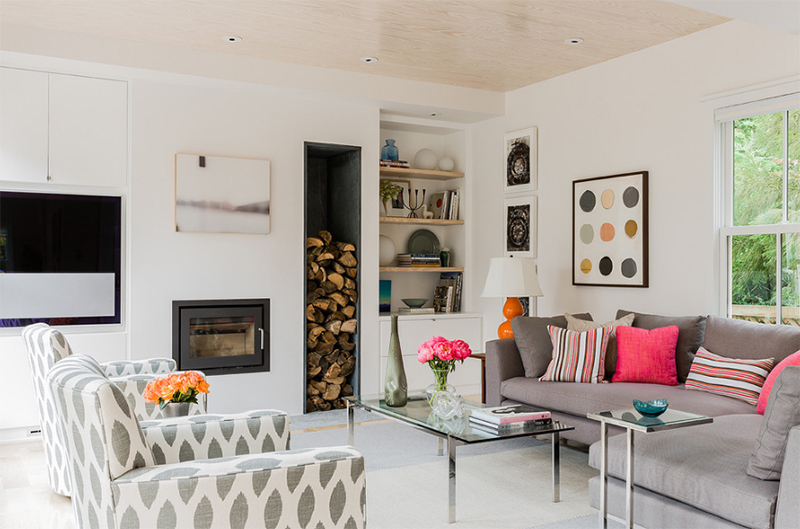 What you will see in today’s round up are contemporary living areas that are surprisingly adorned by firewood. And there are so many different ways to do that. Who would expect that firewood can actually look great in the living area? I also love that teardrop pattern. I have seen that in many different rooms and I just like its colors and its entire look. But aside from the area rug, I also like the look of the firewood in the fireplace area. Just look at the cute pattern created by the way it is arranged! You will no doubt get that industrial and contemporary feel altogether in this living room with a wooden cube coffee table. 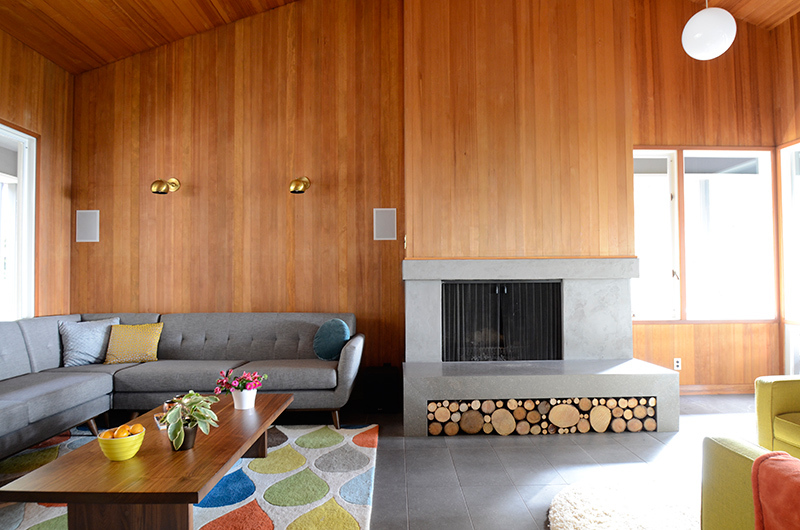 Its concrete fireplace stands from floor to ceiling with neatly arranged firewood on the side. Not sure if this fireplace uses firewood because it looks like it doesn’t. Nevertheless, it added warmth to the living room and has brought the feeling of nature into it. I would guess that this living room would look even nicer when the firewood storage is full of wood from top to bottom but it does look beautiful because of all the wooden elements and earth tones that you can see in this space. Lovely living room, right? It looks really neat and just beautiful! The table here is very artistic and just fits well in this space that has wooden and white features. Under the counter that extends from the fireplace is the storage for firewood. 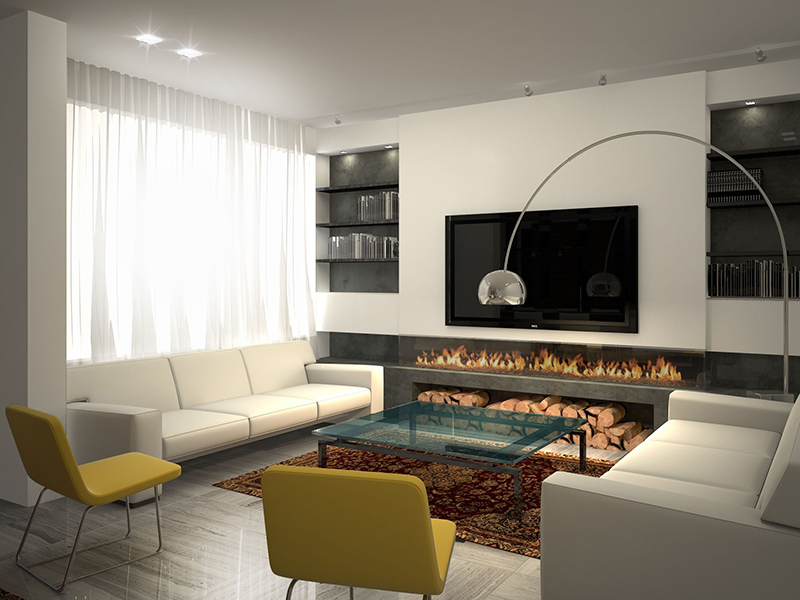 A built-in fireplace which doesn’t look like the usual fireplace design we see because of its contemporary style. On the side is firewood storage. 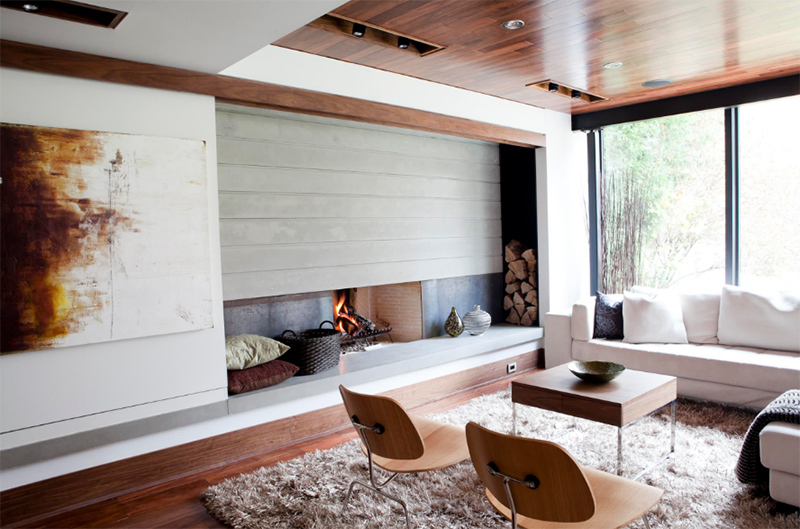 I like how this fireplace is designed by merely adding a void in the concrete wall. I totally love the color palette of this living room from the patterns of the chairs and throw pillows to the wall decors. I also like how the texture of wood is brought to the space through the firewood. I could get that masculine feel in this space because of its dark colors. But you can also see the impact of the firewood in here that is arranged from the flooring covered with laminated wood to the top portion of it that has some lights. If you do not have enough area to create a void for firewood storage, this one is a good idea. Install a rack just beside the fireplace and the neatly arranged firewood will no doubt be an additional decor to your living area. 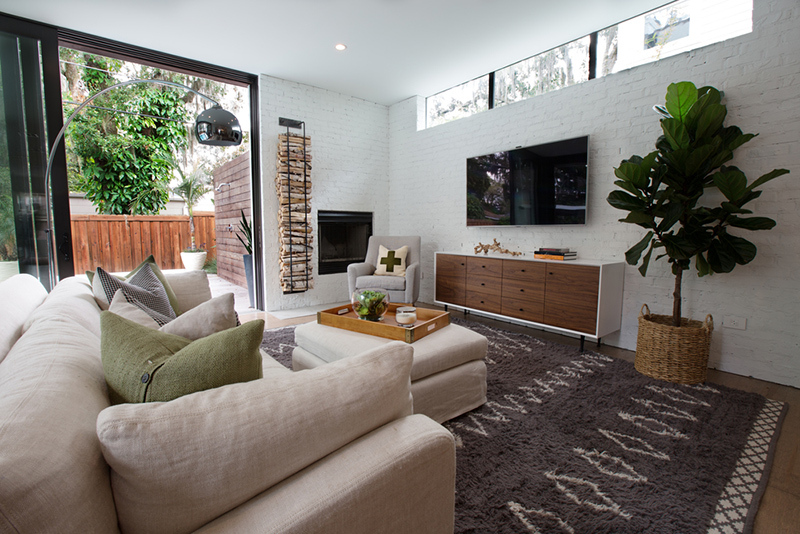 Notice also that this living space made use of white brick walls and a soft gray area rug that defines the area. There is really something about animal head decors that both bring some exotic and interesting feel to the space. You can see here that it has firewood storage on both sides to create that balanced look. 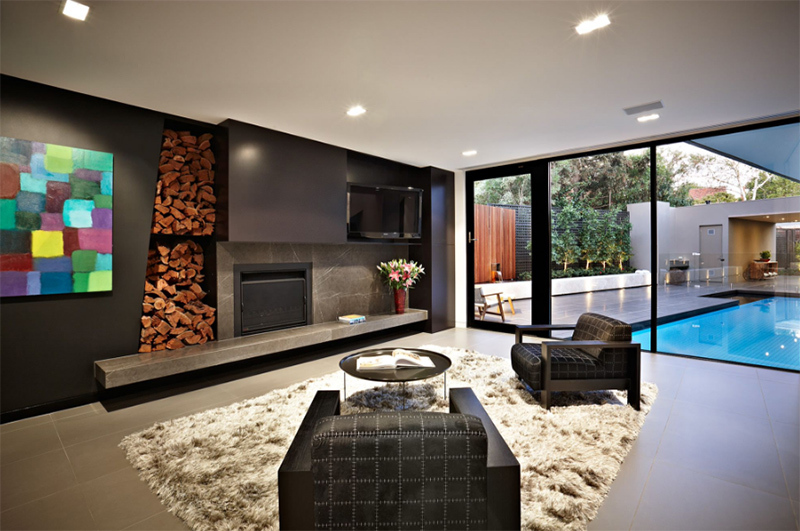 Love the neat look of this living area. Apart from the fireplace, it also has a bookshelf on the wall too just below the wall gallery. There is also firewood storage on the wall as well which breaks the monotony of colors. What caught my attention in this living area is the turtle shell decor and the owl decors in the fireplace. 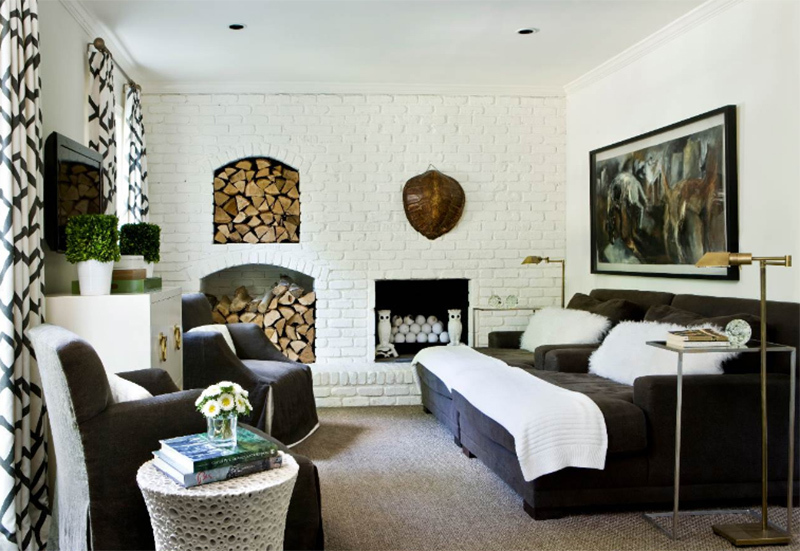 It also looks good with the white bricks on the wall as well as with its comfy gray furniture too. This is such a neat looking living area! It has firewood storage at the back of the television set which is actually a very nice backdrop. You can also see how the gray colors are used here. So nice, right? 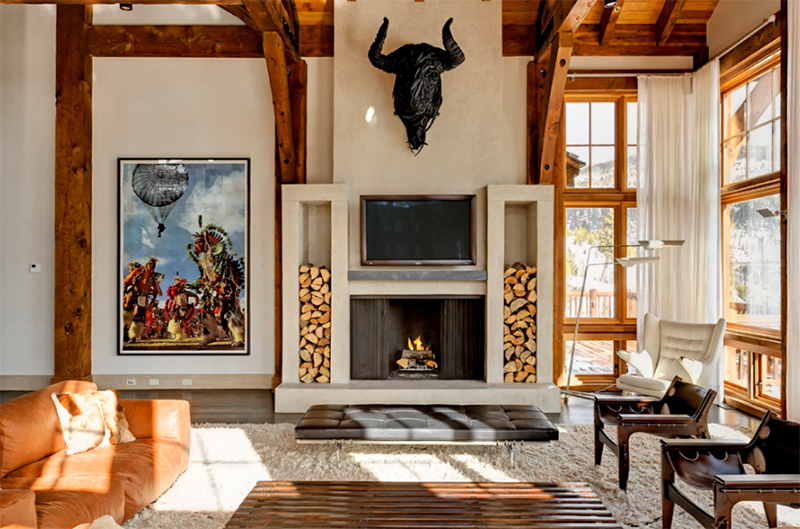 What breaks the dark colors in this space is that colorful painting and the firewood because of its wooden textures. It is also nice that the area opens up to the pool and deck which brightens the entire space. 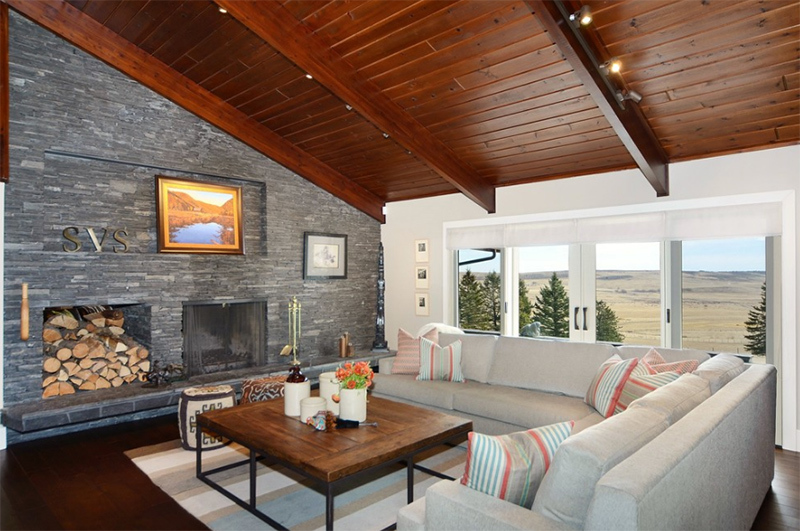 This gives us some subtle classic feel because of the wooden ceiling and the stone walls for the fireplace. And I know you can notice what breaks the textured wall in here. 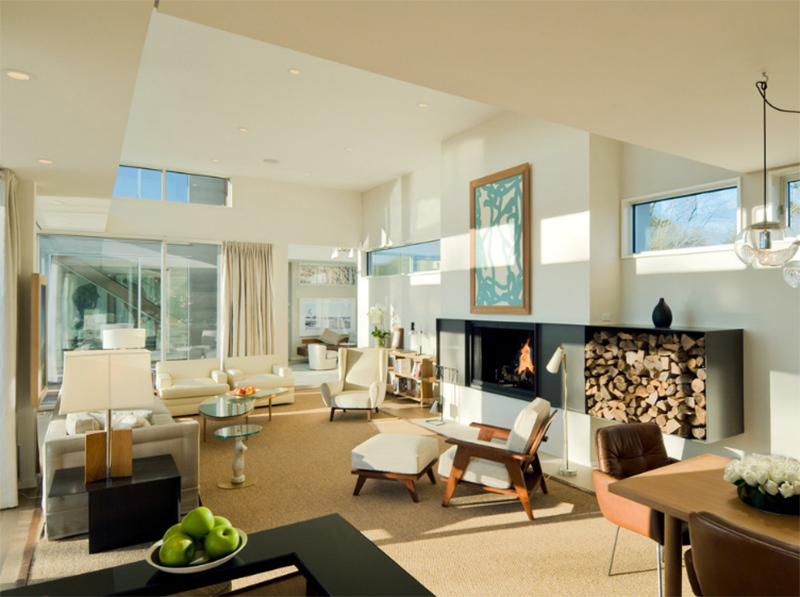 For this living room, it used a modern fireplace that is suspended from the ceiling and stands on the floor. You can see that it added a rack for firewood storage and it never appeared distracting at all. I also love the pops of yellow in the area. This one has a similar fireplace to the previous living area. But this has a simpler look surrounded with glass. The firewood storage also doubles as a bench. That artistic wall decor looks really nice and compliments with the presence of wood next to the fireplace. I also noticed that this living area also has a turtle shell decor too that is painted in white. 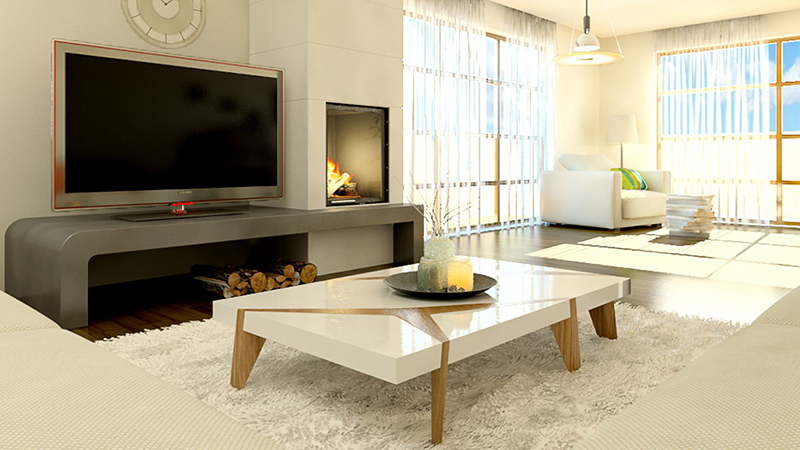 Wood, white, cream and black look really beautiful in this living area! 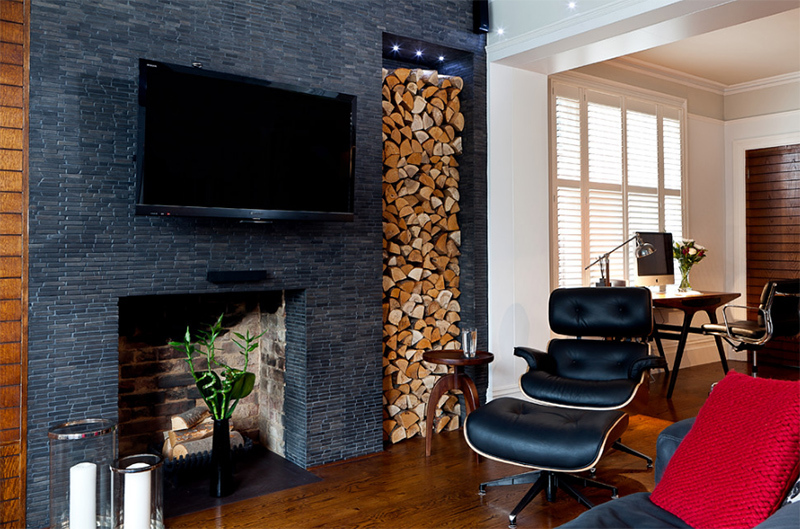 just beside the black fireplace is the firewood that adds a warm feel to the spacious interior. Those wall decors look really interesting! It is also a good idea for a DIY. 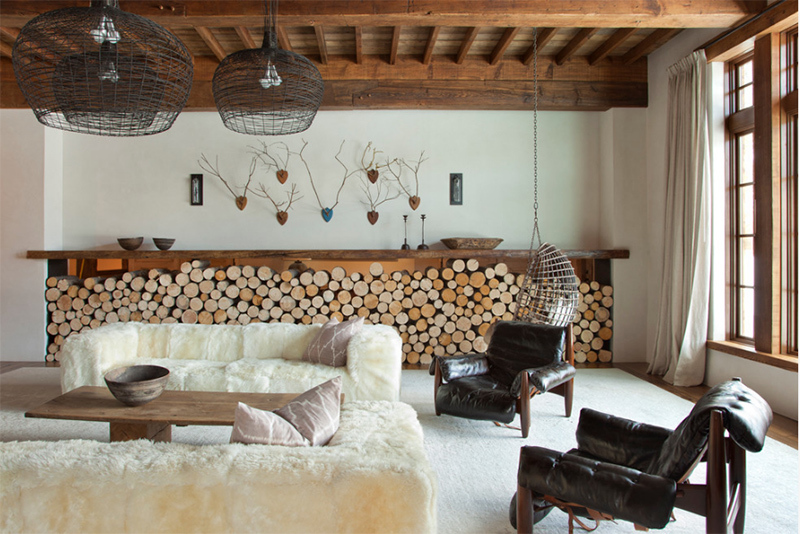 The softness of the sofas is a lovely contrast to the firewood storage that occupies a large position of the space. 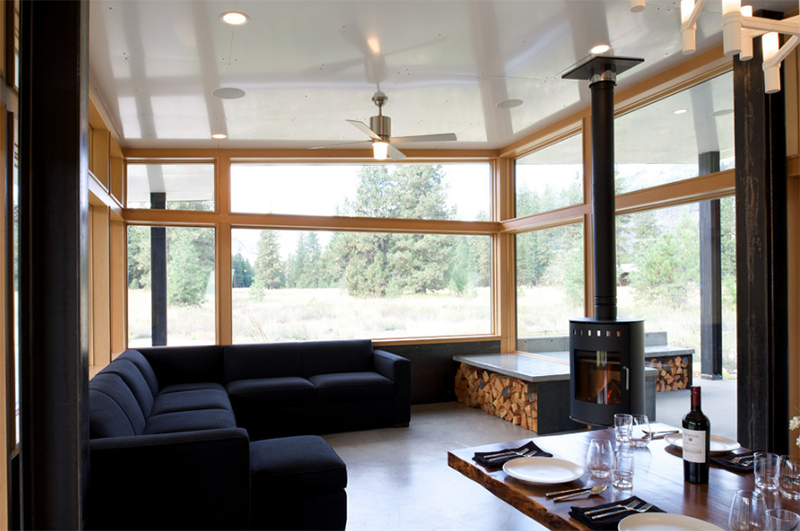 Like me, I know that you are also surprised how firewood actually made the living areas beautiful. And I like how the firewood was arranged in that manner. Well, you know, you can actually just dump firewood in whatever manner but the way the firewood in the above images were arranged made it a lot more stunning. And I know you will agree with me because of what you have seen in the above images. 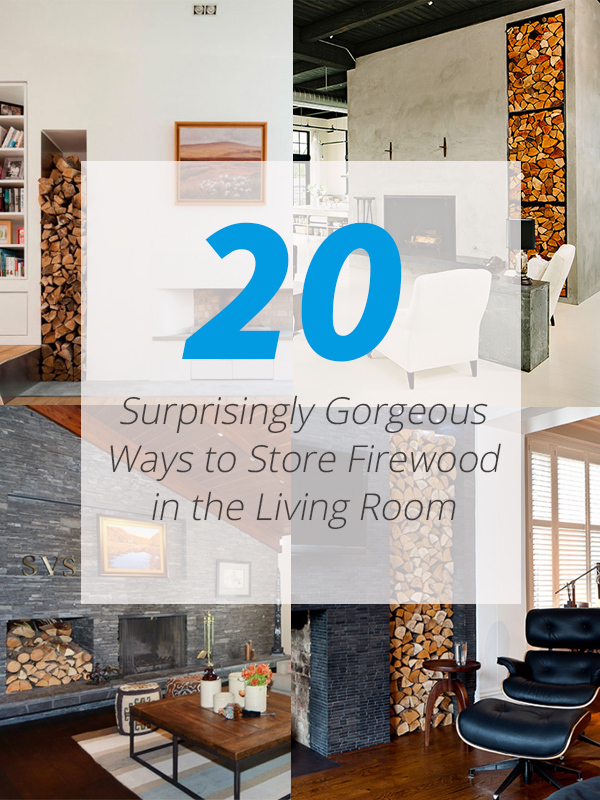 So, are you going to change the way you arrange firewood after seeing this list?